Retail giant Marks and Spencer have joined supermarket clothing retailer Asda in recommending that the majority of the garments they sell should be washed at 30 degrees Celcius rather than 40 degrees Celcius. Studies have shown that this small change reduces electricity consumption by washing machines by around 40% on average. Modern washing detergents are designed to work well even at low temperatures dissolving rapidly into water, and going to work right away. The addition of extra cleaning ingredients have made detergents far better at removing stains, and so it is no longer necessary to wash most garments in hot water. Repeated tests have shown that washing at 30 degrees Celcius show no significant reduction in performance for everyday loads. In September 2006 detergent maker Ariel launched a Wash at 30 Degrees campaign in which they suggested 1.6 billion kWh of electricity are wasted annually by running washing machines unnecessarily at 40 degrees. They claimed that with their cool clean technology, clothes would still be “brilliantly clean” when washed at 30 degrees. It is however recommended that towels, underwear, sportswear, baby clothes, all bedding, and heavily stained items still be washed at higher temperatures to ensure they get completely clean. 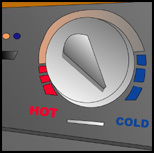 It is possible to test the increase in efficiency offered by turning down the temperature using a energy and power meter or an electrisave electricity monitor. Asda changed the washing instruction labels on their clothes in March 2007 and have so far received no negative feedback from their customers. At that time Asda pointed out that if all 237 million George branded garments sold annually were washed at 30 degrees Celcius, £200,000 of electricity would be saved each year. 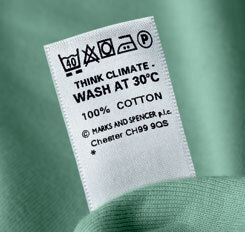 From July 2007 Marks and Spencer will continue to display their standard maximum washing temperature warning on their labels, but will add Think climate – wash at 30°C. Information about the potential benefits to the climate will be provided on leaflets in-store, in commercial advertising, and on the Marks and Spencer website. The decision by Marks and Spencer is part of their so called Plan A – aimed at getting M&S carbon neutral by 2012 and helping customers and employees live a healthier life. It is also part of the We’re in this Together campaign by a group of major UK companies aimed at making it easier for their customers to take steps to reduce climate change. Partners in the campaign include B&Q, Tesco, British Gas, Sky, and HSBC.